Explore the national parks of the Northern Rockies, including Glacier National Park in northern Montana and Jasper and Banff National Parks in the heart of Canada. - Susane and Paul, N.
Discover some of the most spectacular landscapes of the Northern Rocky Mountains during leisurely hikes and drives through Glacier, Banff, and Jasper National Parks. All World Heritage site parks. Glacier National Park: Drive along Going-to-the-­Sun Road, famous for its breathtaking landscapes and wildlife. Hike along St. Mary Lake, which showcases the divide between the Great Plains and the Rocky Mountains. And in Whitefish, Montana, you'll go hiking, visit a nature center, and enjoy vistas from the mountain summit. Banff National Park: Take a hike along emerald Lake Louise, often called the "Jewel of the Canadian Rockies." Journey to the Columbia Icefield for a once-in-a-lifetime "ice coach" tour of Athabasca Glacier. Other highlights include a gondola ride to the top of 8,000-foot Sulphur Mountain, overlooking the town of Banff, and a drive along Tunnel Mountain Road where you'll see the Hoodoos and Bow Falls. Jasper National Park: Explore the geological marvel of Maligne Canyon and enjoy a cruise on cerulean Maligne Lake, the largest glacially formed lake in the Canadian Rockies. Later, drive along the Columbia Icefields Parkway, which parallels the Continental Divide and features dramatic landscapes and wildlife such as bear, moose, elk, and mountain goat. You'll also stop at the Glacier Skywalk, a transparent-bottomed observation deck suspended nearly 1,000 feet above the valley floor. 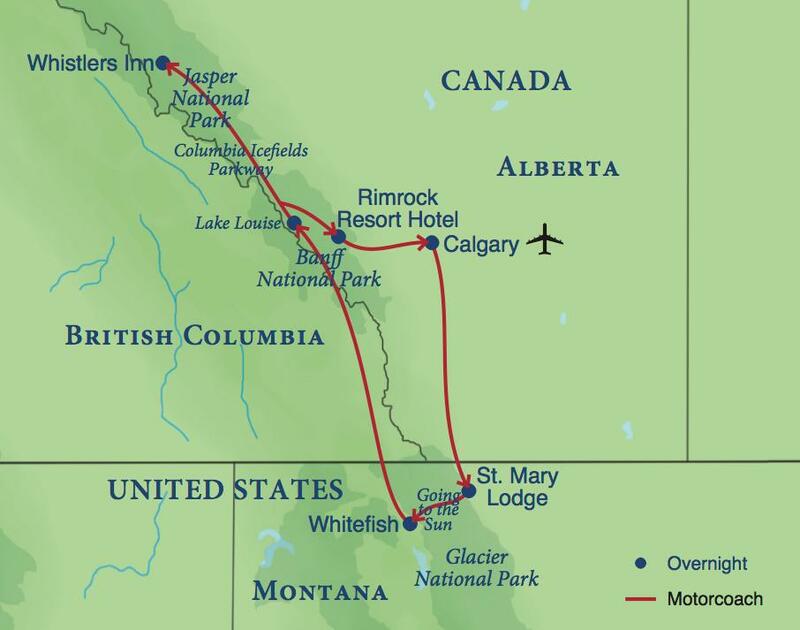 Day 2 — Calgary / Waterton Lakes National Park / Glacier National Park, U.S.
Day 11 — Banff and Depart for the U.S.